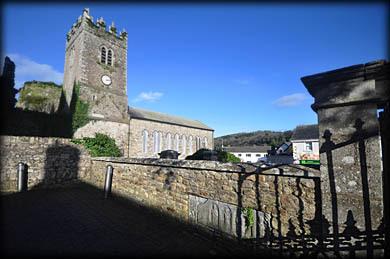 The Augustinian Priory of Inistioge was dedicated to St Mary and St Columba/Columkille. 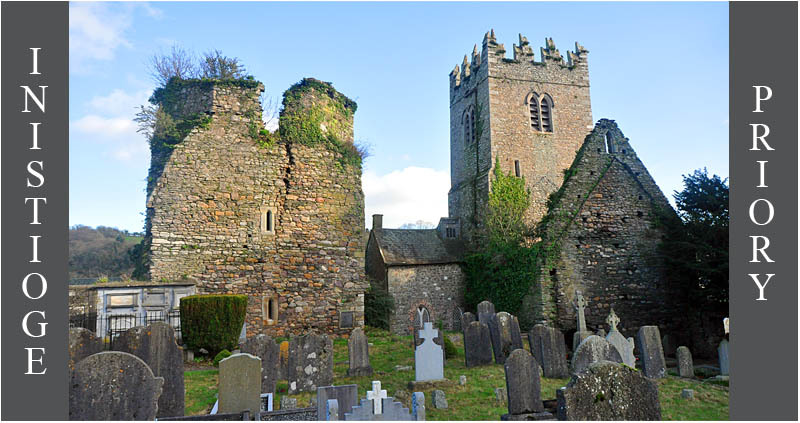 It was built in c.1206 by the Anglo-Norman knight Thomas FitzAnthony, Seneschal of Leinster. The Priory, which is purportedly built on a the site of an earlier church founded by St Columba in the 6th century, was run by monks from Bodmin Priory in Cornwall. The oldest building on the site is the old keep, AKA "The Black Castle", pictured left, it dates to c.1210 and was probably used as a residence for the Prior. The structure is irregular in shape, being almost square at the base and converted into an octagonal form by broaches springing from the quoins, similar to the nearby church tower at Knocktopher. 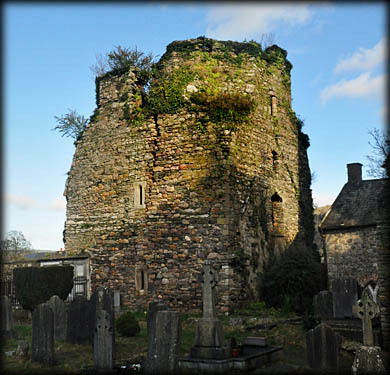 The belfry or crossing tower, see top image, has been attributed to the last Prior Milo FitzGerald, aka Milo Baron, who was appointed Prior in 1528, but the structure and the cloisters fragments found on the site appear to be much earlier. Looking up at the west wall of the keep. Very little remains of the original monastic buildings, a small part of the nave extends west from crossing tower, there is a low entrance in the west wall. On the north side of St Mary's, Cof I, Church are the remains of the Lady's Chapel. The present St Mary's, built in 1824, incorporates the crossing tower. 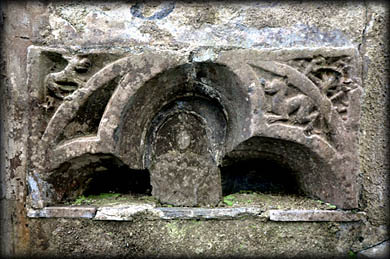 Sculptured fragments, of the original cloister pillars, are built into the inside of the east perimeter wall of St Columba's Roman Catholic Church. This church probably stands on the site of the cloister. Built into the north wall are several more architectural fragments. The Priory was suppressed in 1539. 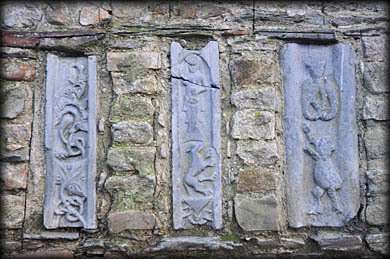 Some carved fragments from the cloister can also be found at the nearby St Columcille's holy well. Cloisters fragments, in the east wall, are pictured above and below. I could not obtain access to St Mary's Church during my visit, hopefully I will have better luck on my next visit. There are two interesting grave slabs on the floor of the entrance in the present nave. One of them is believed to be the grave slab of the first Prior of Inistioge, Alured, who came from Bodmin Priory, he was Prior from c.1212-1227. 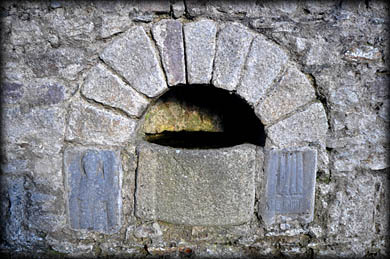 The monks at the nearby Kells Priory, also came from Cornwall. Also present in the church is a 12th century baptismal font. 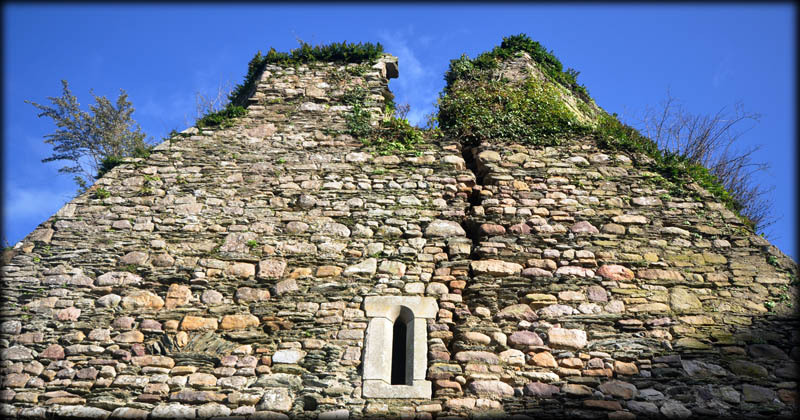 Situated: The remains of the Priory are located on the grounds of St Mary's C o I, and St Columba's R.C. church in the centre of the village. Discovery Map 67: S 6346 3792. Last visit Feb 2019.